Custom navigation bar: adds links to the main sections of the Web site. Breadcrumbs: shows your current location in the Web site’s page hierarchy. Translations widget: lists translations for the current page. The list of languages available are the same languages supported by MoinMoin. Custom footer: adds information about gNewSense and license of the text and media in the Web site. This theme is being tested with the quick, or desktop, installation provided by MoinMoin 1.9.x. 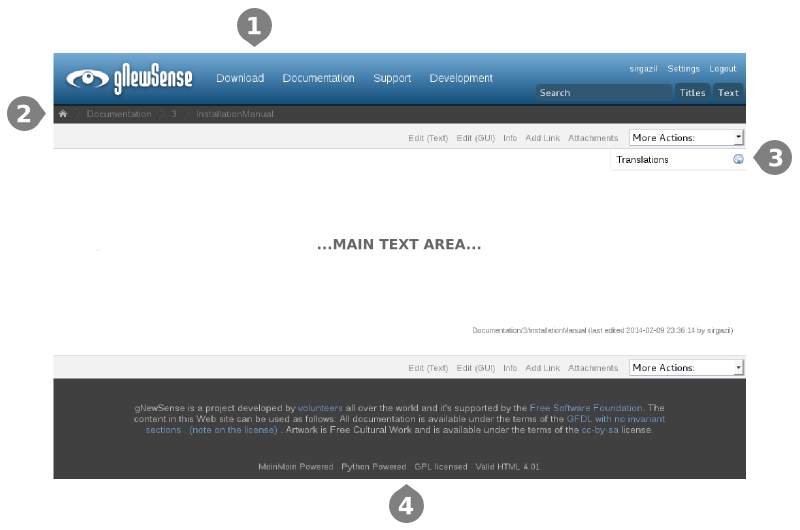 The following steps are for installing the theme in such a configuration. Note that these steps assume you have a copy of Galaxia in which you’ll find the website-theme directory with the appropriate files. Put galaxia/website-theme/galaxia.py file in the moin-1.9.x/wiki/data/plugin/theme directory. Put galaxia/website-theme/galaxia directory in moin-1.9.x/MoinMoin/web/static/htdocs. Add the following variable to LocalConfig class in moin-1.9.x/wikiconfig.py file. The language_default variable is used by the Translations widget. Open your browser and go to http://localhost:8080/. Create a user by clicking on “Login”. Login as the user you created and select galaxia theme from your user preferences. Galaxia theme doesn’t use MoinMoin Navigation bar by default, but you can still enable it. Look for the def header(self, d, **kw) method and uncomment the line #self.navibar() by removing the # character. Save the file and restart MoinMoin to see the changes. The Web site theme adds some text that doesn’t have translations in the translations catalogs provided by MoinMoin. This means that the text in the Custom navigation bar and the title of the Translations widget will display in English only. To be able to see these additional texts in any of the languages supported by MoinMoin, you can use page dictionaries. Read MoinMoin’s Help on dictionaries for more information. By default, the languages listed in the Translations widget are the same languages supported by MoinMoin. To add a new language to the list, you can add a new translation catalog to MoinMoin/i18n, either in your local installation of MoinMoin or, better yet, in the MoinMoin project.